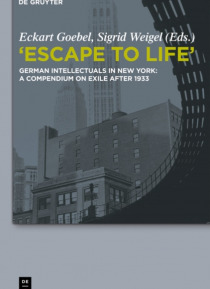 After 1933, New York City gave shelter to many leading German and German-Jewish intellectuals. Stripped of their German citizenship by the Nazi-regime, these public figures either stayed in the New York area or moved on to California and other places. This compendium, adopting the title of a famous volume published by Klaus and Erika Mann in 1939, explores the impact the US, and NYC in partic… ular, had on these authors as well as the influence they in turn exerted on US intellectual life. Moreover, it addresses the transformations that took place in the exiled intellectuals' thinking when it was translated into another language and addressed to an American audience. Among the individuals presented in this volume, are such prominent names as T.W. Adorno, H. Arendt, W. Benjamin, E. Bloch, B. Brecht, S. Kracauer, the Mann family, S. Morgenstern, and E. Panofsky. The authors of the essays in this compendium were free to choose the angle (biography, theory, politics) or aspect (a single work, a personal constellation) deemed best to illuminate the given intellectual's work. Acclaimed NYC photographer Fred Stein, a German-Jewish refugee from Dresden, produced numerous portraits of exiled intellectuals and artists. A selection of these compelling portraits is reproduced in this book for the first time.